This initiative comes from four members of Vermont’s Progressive Party on the Burlington City Council, who plan to introduce a resolution on October 7 effectively barring the F-35 from being based in the middle of Vermont’s most populated area. In contrast, Vermont’s official “leadership,” almost all Democrats, still thinks basing nuclear-capable warplanes in a Vermont community is a dandy idea. 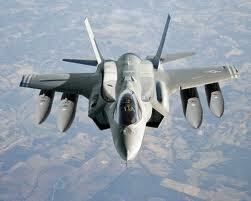 Not only is the F-35 roughly ten years behind schedule and 100% over budget, it’s still years from being operational. At Eglin Air Force Base in Florida, where F-35’s are being tested, its current safety limitations are severe: “the squadrons at Eglin are prohibited from flying at night, prohibited from flying at supersonic speed, prohibited from flying in bad weather (including within 25 miles of lightning), prohibited from dropping live ordnance, and prohibited from firing their guns,” according to a September 16 article in Vanity Fair. Shumlin supported everyone, saying: “Vermonters are well-served by our federal delegation’s thoughtful involvement and deep experience in these issues, and I agree with Senator Leahy, Senator Sanders and Congressman Welch.” Translation: whatever.